Former George W. Bush economic advisor Keith Hennessey is tired of the Obama administration dragging its predecessor's name through the mud. So rather than simply imply or assert that President Obama's fiscal record is worse than George W. Bush's, like most conservatives do, Hennessey actually tries to make the argument that Obama's policies are more profligate than Bush's. I remember Bush's fiscal policies, and the political environment that surrounded them, pretty well. In the wake of the Bush administration's collapse, its defenders have been mostly laying low, trying to make their man look good by taking passive-aggressive shots at his successor. I've been waiting for Bush's loyalists to try to rewrite the past. So consider this fisking the beatdown that was nine years in the making. It is true that 10 years ago we had a budget surplus of more than $200 billion, and that CBO projected surpluses “stretching out toward the horizon.” When CBO built its budget baseline for 2001, they had not yet accounted for the bursting of the late 90’s tech stock market bubble and the effect it would have on federal revenues. Like families, businesses, and investors, CBO made a mistake: they projected future revenue growth that was never going to occur. Critics of the Bush Administration hinge their comparative argument on this single mistaken budget projection which in hindsight analysts from both parties acknowledge was wildly inaccurate. As budget surpluses appeared in the late 1990s, some level of giddiness crept into the thinking of both parties. But it was the right that went completely overboard. Conservatives were writing books like "Dow 36,000" and insisting prosperity would last forever. You might think it's odd that the right would be hyping prosperity during a time when a Democrat held the White House. But the giddiness had a political purpose: it was useful to disarm Democratic fears that tax cuts might weaken America's fiscal position. it is true that the budget has produced pleasant surprises for several years running. But the proper lesson to take from this is not that budget projections are always too conservative--indeed, historically they've usually erred on the side of optimism--but that they're not very accurate. We have funded our priorities. We paid down all the available debt. We have prepared for contingencies. And we still have money left over. The Bush administration furiously and successfully beat back Democrats' attempts to inculcate caution and modesty about the projected surpluses. To cast the administration as victims of a "mistake" requires a a staggering level of chutzpah. By the time then-Governor Bush began his Presidential campaign, there was a broad bipartisan Congressional consensus to create a universally subsidized prescription drug benefit in Medicare without offsetting the proposed spending increases. Bush joined that consensus and enacted it into law. This is misleading bordering on outright false. When Clinton was president, Congress had to operate under pay-as-you go budget rules, which meant that any new tax cut or entitlement increase needed to be offset by an entitlement cut or tax hike. In 2001, Congress waived those rules in order to facilitate passage of the Bush tax cuts, which had no offsets. In 2002, Congress let those rules expire, over Democratic objections. It's also worth noting that Democrats in 2001 tried to force Bush to account in his budget for the prescription drug benefit he had already endorsed, but were defeated by the GOP. If the Republicans had not brushed aside the budget measures the Democrats had been using (and have since put back into place), the Medicare benefit would have needed spending cuts or tax hikes to be enacted. Indeed, if you're wondering why the GOP had an easier time with its 2003 Medicare entitlement than the Democrats have had with their 2010 health care entitlement, the main reason is that the former put the whole thing on the country's credit card while the latter have had to find unpopular offsets for every dollar they spend. This is sophistry. First of all, Hennessey waves off the portion of the Bush tax cuts that only benefit people making more than $250,000 a year, but there's a lot of money there, so Obama's determination to let them expire represents a significant difference with Bush. Now, it's true that Obama is keeping in place the tax cuts that benefit people who make under $250,000. But to equate that decision with enacting the tax cuts in the first place is absurd. Both public opinion and the political system have a huge bias toward the status quo. 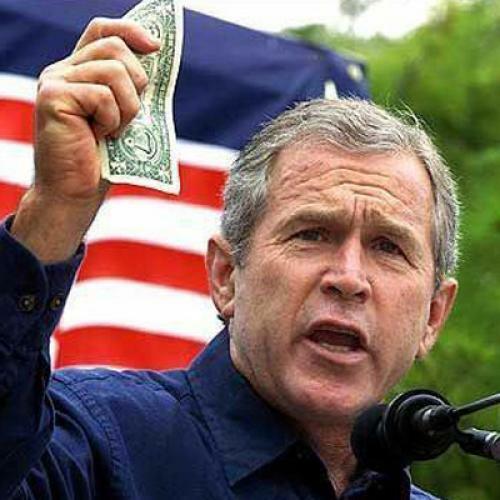 Once the Bush tax cuts were in place, anybody opposing them became a tax hiker. Hennessey understands perfectly well that Obama could easily maintain Clinton-era tax rates on the middle class if Bush had never cut taxes. Since Bush did cut taxes, restoring those rates in the face of unwavering GOP opposition would be a near-impossible task for Obama. The lowest proposed budget deficits in a hypothetical “Obama decade” would exceed the Bush average budget deficit, even if we assign most of the TARP spending to Bush. This leaves an open question: Which is the decade of profligacy? You can see that budget deficits during President Clinton’s eight years averaged 0.8 percent of GDP. Clinton folks will tell you this is because of his brilliant policies, and in particular the 1993 budget law. I think most of it is the result of tech bubble-induced higher capital gains revenues causing total taxes to surge to record levels. So, okay. Hennessey discounts low deficits under Clinton because the stock bubble helped cause them. I think there's a lot of truth to that but far less than Hennessey does. Yet he won't discount the deficit explosion under Obama that clearly was caused by the 2008 economic crisis. He plays up economic factors that help the Democrats, but ignores economic factors that hurt them. Nice trick. Again, Obama can be blamed for not doing enough to clean up the mess he inherited. (I'd argue that political impediments make this a nearly impossible task for Obama, but put that aside.) Bush is clearly guilty of having played an enormous role in having created the mess in the first place. To blame Obama while exonerating Bush is astonishing.